Marmo Maple is a fast growing seedless maple relative to the popular Autumn Blaze Maple. It grows with a broad-columnar form and a strong central leader. It is particularly prized for its brilliant orange-red fall color, although temperature and site conditions play a role in its intensity. It is a disease and insect resistant tree that is adaptable to heavy clay soils. It will grow ultimately to 70' tall and 35'-40' spread (in 50+ years). Sun Valley Maple is a cross between the brilliantly coloured Red Sunset and and popular Autumn Flame red maples. The brilliant red fall colour is exceptionally long lasting. It performs well in many different soil and site conditions, and is excellent as a large lawn or street tree. It grows to 25' tall by 10' wide in 10 years, and will mature larger to 40' or more. 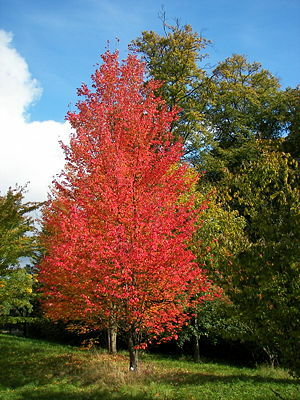 Embers is a very hardy and vigorous growing red maple variety that has a bit narrower profile when it is younger, and becomes more rounded as it matures. It grows in most soil conditions to a height of 50', and has a strong red colour show to its leaves in the fall. ** Available by special order. 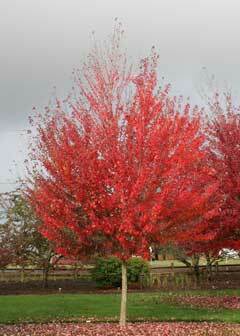 Autumn Blaze maple is one of the most vigorous growing maple trees, and now it is available in a multi-stemmed form. 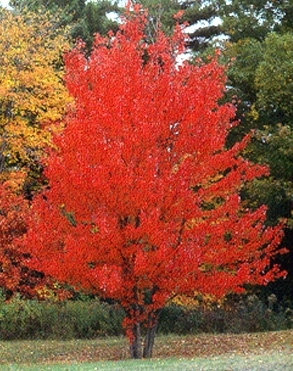 Arising from a cross between native silver maple and red maple, it is noted for the outstanding fall colour and adaptability to most soil conditions. It will grow to 50 feet at a rate of 1 to 1.5 feet per year. This delightful tree has an oval to rounded head full of handsome green glossy leaves! It grows 20-25 ft. tall at 1.5 ft. per year and is extremely tolerant of most conditions. White summer flowers become red winged fruit in fall, accented by dramatic orange red foliage. 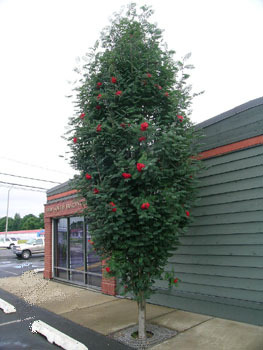 It is an excellent specimen or screening plant tree, and can even be sheared if desired. This strong growing narrow upright tree has an airy, graceful texture. The large white flowers that appear in early May are followed by edible black fruit, but you won't get any as the birds will likely eat them all. Summer foliage is bluish-green, with leaves turning coppery orange in the fall. A new selection that has shown improved disease resistance. (Not available). 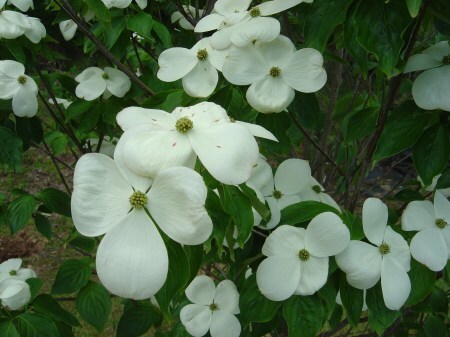 A cross between Flowering Dogwood and Chinese Flowering Dogwood, this Stellar series hybrid dogwood (formerly known as Galaxy) starts to bloom in April with large white blooms that are produced in great abundance covering the newly emerging dark green leaves. The plant habit is taller than wide with branches low to the ground and a uniform spread all the way up, and it grows to approximately 15' - 20' tall. This is a very slow-growing, incredibly compact, dwarf specimen tree for your sunny garden! Grafted on a stem, its small, unique fan-shaped leaves grow in a tight spherical mass and turn bright golden in the autumn. It grows best in moist, sandy, well-drained soil to a height of approx 8 feet. Cup-shaped, fragrant purple-pink flowers cover this compact multi-stemmed clump in mid-spring, followed by large pointy green leaves which turn bronze in the fall. It will grow to 33 ft. tall by about 25 ft. wide in sun with an oval-shaped head. 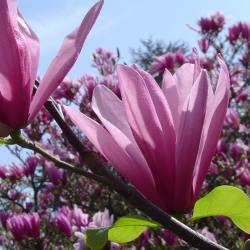 Although hardy, it must be planted where sheltered from strong winter winds to prevent tender flower buds from freezing. 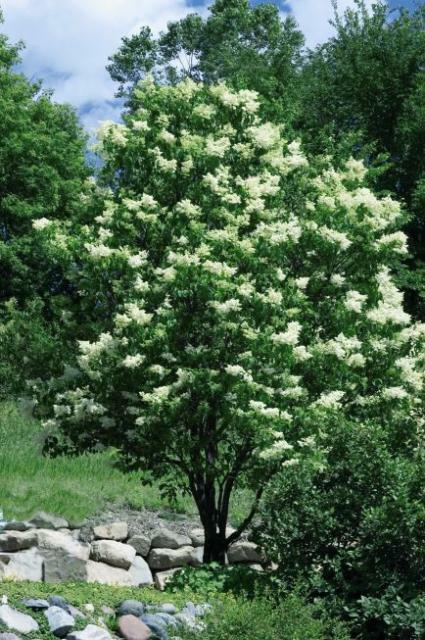 With each individual flower looking like it should be on a wedding car, Brandywine Flowering Crab is a beautiful specimen tree for any home. It grows to be about 20 feet tall at maturity, with a spread of 15 feet, and is often found low branched to the ground. It is tolerant of many soil conditions and is very winter hardy. ** Available by special order. 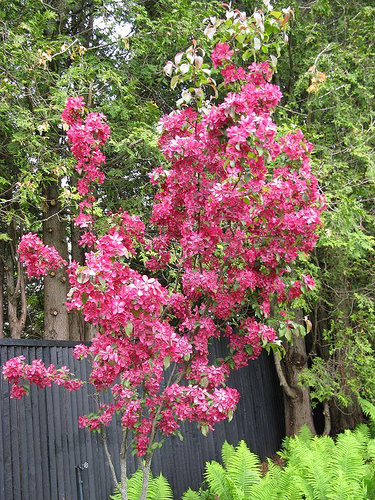 This large shrub or small tree makes for a beautiful addition to the garden. Deep dark pink flower buds open to pure white showy blossoms that form tiny bright red fruit that persist into winter. Fall colour is a unique bronzy yellow. It can grow to 10 to 12 feet tall and wide, in most soil types, and is noted for it's incredible disease resistance. ** Currently unavailable. 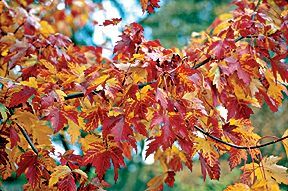 This new Pin Oak variety has a very narrow, dense form that will grow to 45+ feet by about 15 feet wide and has lovely glossy green oak leaves that turn a striking red in the fall, and then persist as brown leaves well into the winter. Young trees occasionally produce a 'lazy lateral' branch that should and is easily pruned off to maintain the pyramidal form of the tree. Grows in most soil and site conditions. 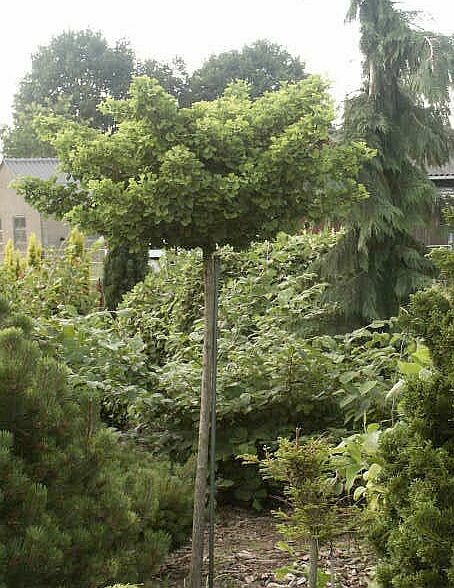 Vigorous growth in a neat upright rounded form makes this a choice lawn tree. Dark green leaves with silver reverse turn orange in fall. 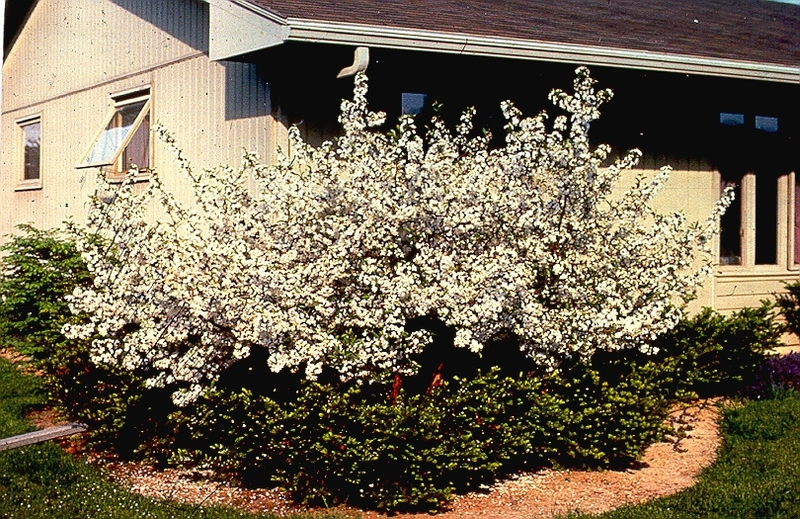 White flowers are followed by red fruit clusters that will attract birds. Could grow 20 feet tall and 15 feet wide and prefers well-drained soils. 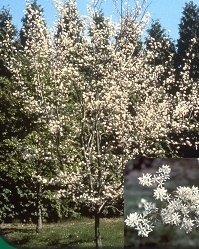 This multi-stemmed small tree has large showy clusters of creamy white flowers in mid summer. 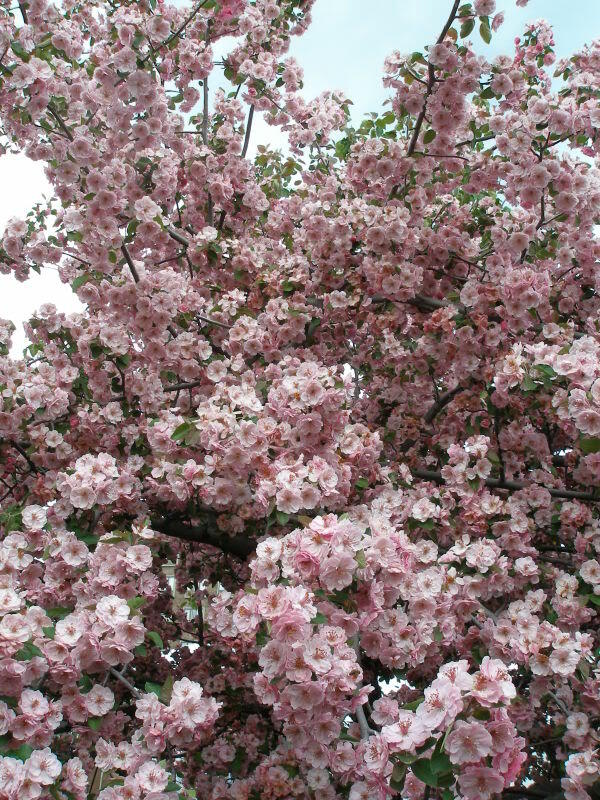 Its cherry-like branches form a rounded crown growing to about 25 ft. high at approximately 1-2 ft. a year. A hardy tree, it should be planted in sun or light shade, and is effective as a specimen or accent plant.